In my last post I wrote about the problem with month-over-month growth rates. One of the issues I talked about was that when your revenue plan numbers are based on a constant m/m percentage growth figure (i.e. you're projecting to grow exponentially), your short-term objectives are likely too low relative to your longer-term goals. 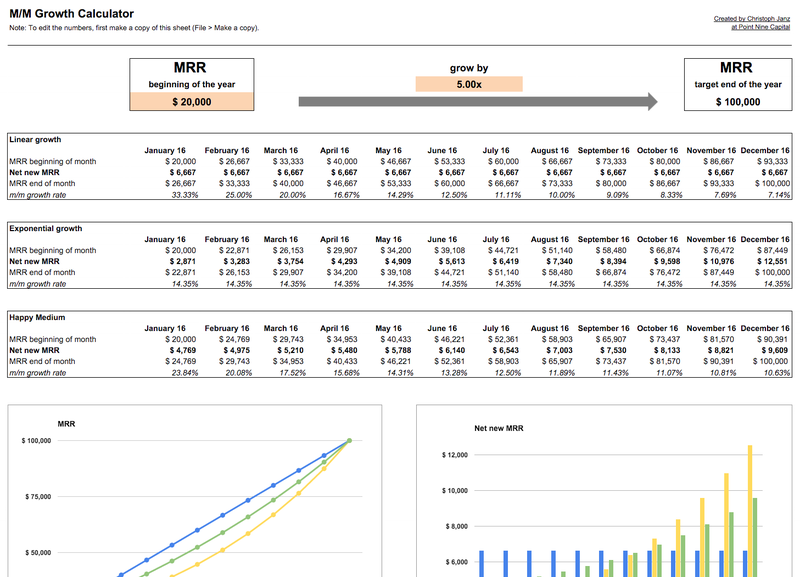 As an example, I showed a (fictional) SaaS startup that wants to grow from $1,000 in MRR to ~ $85,000 in MRR within one year. If that company projects exponential growth, it will have to add less than $7,000 in net new MRR in the first half of the year in order to be on track ... but to stay on track, it needs to add more than 10x that amount in the second half of the year! 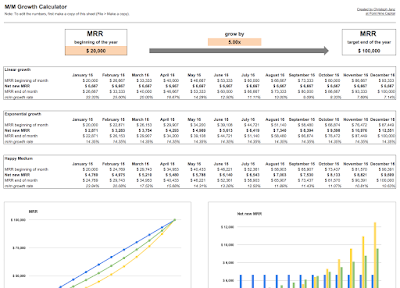 To follow-up on the topic, I've put together a very simple (Google Sheets based) calculator which startup founders might find useful when they work on their plan for 2016. The purpose of this simple sheet is not to replace a thorough bottom-up planning which is based on the key drivers of your business. Instead, the idea is that it might be a useful input or cross-check for a more detailed plan. Click here to check out the tool. The first one is based on linear growth. It just takes the total net new MRR that you want to add throughout the year and assumes that you're adding 1/12th of it each month. The second one is based on an exponential growth assumption, i.e. it assumes that you're growing at a constant percentage growth rate every month. The third alternative, which I've called "Happy Medium", has a growth curve that sits between the linear and the exponential option. You can see that well if you take a look at the charts below the numbers. I think most early-stage startups should project a trajectory which, like the "Happy Medium" path", is somewhere between the linear and the exponential option. What do you think?